A real gem for Winter gardens, producing long lasting floral displays from late October through to Spring. Clusters of really fragrant, pale to deep pink, long-lasting flowers just seem to keep going and going. Prefers a sunny spot, it can be grown in large pots. A real gem for winter gardens, producing long lasting floral displays from late October through winter into spring. 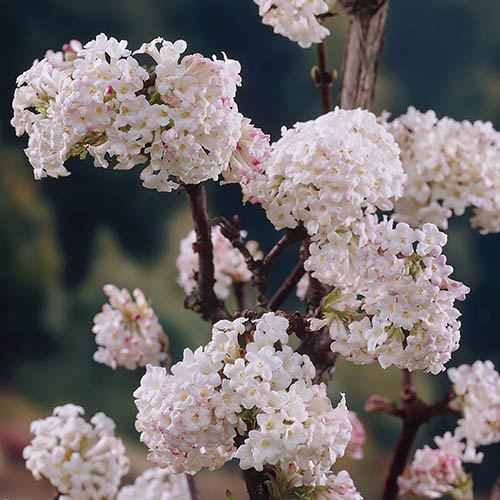 Clusters of really fragrant, pale to deep pink, long-lasting flowers just seem to keep going and going in winter! A compact shrub at 2.5m tall or so after 10 years, it is easy to manage, and very hardy once established. Some flowers may get frost damage in extreme cold, but new ones appear quickly, and the plant is unharmed. Preferring a sunny spot, it can be grown in large pots. Because of it's stunning fragrance and winter displays, plant it close to where you can smell it and see it regularly! Supplied as a 2 year old pot grown plant in 9cm pot, 20cm tall, ready to plant. Will grow to 2.5m after 10 years. Will flower one year after planting.